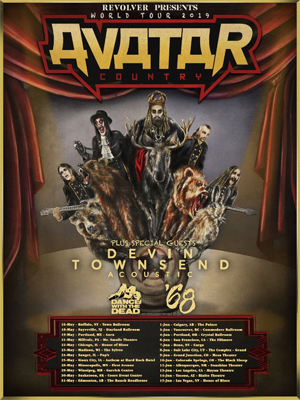 In the midst of a mostly sold out European trek, AVATAR has announced their return to North America on the aptly named “Avatar Country World Tour 2019” Presented by Revolver Magazine. Dates begin on May 16 in Buffalo, NY and stretch coast to coast before wrapping up in Las Vegas, NV on June 15 exactly thirty days later. The band is thrilled to announce that the legendary singer/songwriter and producer Devin Townsend will serve as direct support performing a full acoustic set. Southern California’s DANCE WITH THE DEAD and Atlanta mainstays '68 will open the show.